Admission is free and donations are encouraged. 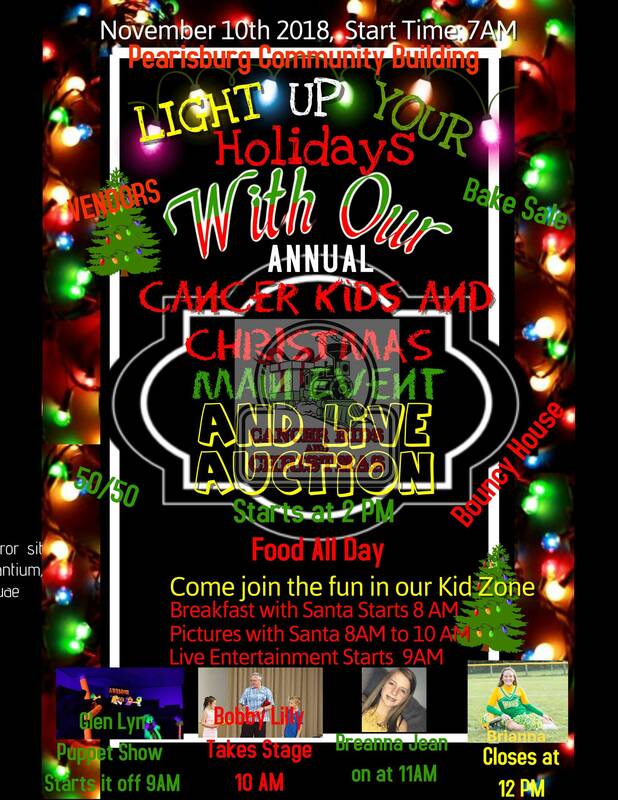 Cancer Kids and Christmas presents their 2018 Main Event featuring Breakfast with Santa, Music and Live Auction Fundraiser on Saturday, November 10, 2018 inside the Pearisburg Community Center. Enjoy Breakfast with Santa and photos in the morning, live music, food, Kids Zone with face painting, crafts, treat bags and bouncy house, bake sale and more than 30 vendors selling their wares throughout the event. Cancer cars and trucks will also be set up on the front lawn of the Pearisburg Community Center. 100% of the proceeds raised will be donated to this year's 15 families. At 1:00 pm, the event program will begin with Cancer Kids and Christmas founder Travis Sparks and special guest speaker Eric Burdette, drawing of the 50/50 raffle that will go to 50/50 family, survivor and family recognition with the Survivor Prayer and live auction that will start at 2:00 pm and will continue until all the donated items are gone. Cancer Kids and Christmas is a local organization that has helped more than 40 families who are battling cancer have a better Christmas since 2012 raising over $100,000.00. 100% of the proceeds and donations are donated to the families each year. Cancer, Kids, and Christmas was founded in 2012 by Travis Sparks after his own battle with cancer and seeing firsthand the strain it put on his own family. He saw that without the help of family and friends, his immediate family may have felt the financial strains to the point of bankruptcy. That would have meant that there would certainly have been no Christmas that year. We provide our cancer families with the majority of all monies raised through our events. With zero dollars going to administrative fees, our Board of Directors are all serving (donating their time) with no compensation from the organization. Please come out and help us raise money for local area families battling cancer so they can enjoy Christmas that cancer so often takes away. On Friday, Cancer Kids and Christmas will be holding a Hot Dog Dinner & Benefit Concert at the Pearisburg Community Center from 5:00-9:00 pm. For more information on this event, visit: http://www.nextthreedays.com/FeaturedEventDetails.cfm?E=490951. The Pearisburg Community Building is located at 1410 Wenonah Avenue in Pearisburg, VA.
To view the event flyer, visit: https://i.imgur.com/8H7YJAC.jpg. For more information, visit: https://cancerkidsandchristmas.com/events or https://www.facebook.com/groups/1540134556220815/.